New year, new Netflix crime docu-series to lose the January blues to – and it sounds like a cocktail of intrigue, suspicion and drug-related killing. Roll up, roll up… What a way to start 2019! In February 2018, North Coast Journal reported that 717 people per 100,000 go missing in Humboldt County every year. Besides countless missing people, this Redwood country in Northern California is home to the Emerald Triangle, an area so called for the huge amount of cannabis cultivated in its soil – supplying the vast majority of the US black market. The triangle, nestled among the dense forests 300 miles from San Francisco, crosses the borders of three counties: Humboldt, Mendocino, and Trinity. It’s the largest cannabis-producing region in the United States, where covert growers have enjoyed the perks of harsh terrain to continue their production in practical secret. So, why Murder Mountain? Why not Marijuana Mountain? For the tourism alone, the area really needs a rebrand. Well, in a grisly twist of events, the mountain was named, at least in part, due to a notorious serial-killer couple, James and Suzan Carson, who terrorised the area in the early 1980s, claiming to be ‘warriors’ in a ‘holy war against witches’. They were charged with the murders of three individuals. The name stuck. 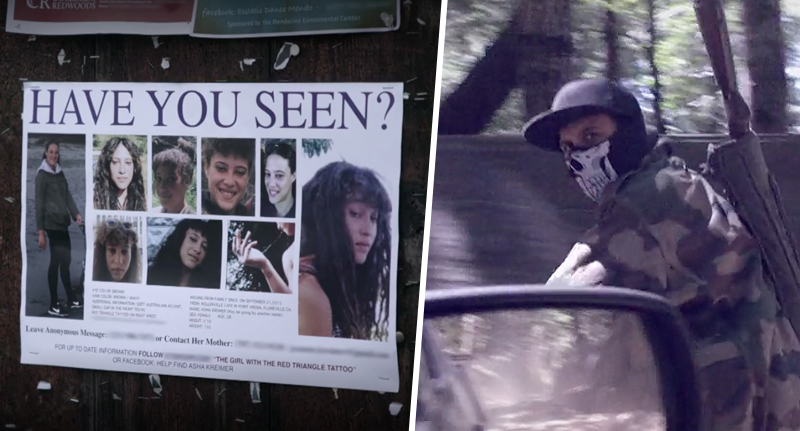 Still, while the tensions between legal and black market cannabis are credited with some of the county’s known homicides, it’s the other missing persons cases which initially attracted Josh Zeman – who directed The Killing Season – to the area for his next project. Speaking to Rolling Stone the filmmaker recalled why he assembled a team for a nine-month exploration of the Emerald Triangle. The series opens with, as far as law enforcement are concerned, the unsolved murder of 29-year-old Garret Rodriguez. It traces how a murder like this could go cold, the growing tensions between the formerly peaceful residents and the authorities who waged a war on drugs in the 80s and – as Zeman puts it – turned the inhabitants’ home into a war zone. The rural area of dense forest, he explained, has been a safe haven for anyone wanting to go ‘off grid’. After the Vietnam War ended, for example, it became a place where veterans could go and live peacefully and treat their PTSD with the crops which grow in abundance. It sounds like an American Utopia – until it wasn’t. After decades of tension since the war on drugs was waged, the approval of California’s Prop 64 in 2016 which legalised adult recreational use of marijuana, the small growers have been forced to retreat to the black market once more because they can’t afford County and state taxes, state permit applications and consultants. And, of course, it’s the black market which brings more crime to the area, as the illegal trade is increasingly seeing the sale of other drugs like meth and heroin. The goal of the series is to show the harm done by cannabis prohibition and, unfortunately, the way to get people to notice is to focus on the negative aspects. But once we shine the light and can disinfect the more negative parts, Humboldt County really will be an incredible tourist destination. It will be the Napa County of cannabis. Legal farmers are the ones who are making that happen. It takes incredible bravery to move into the white market after decades of being silent and in the shadows. But that’s what they’re doing. I’ll be blunt. This sounds incredible.